Zenipower's High Performance batteries offer a high current and stable voltage for the most demanding digital hearing aids and cochlear implants. ZeniPower has been manufacturing zinc air hearing aid batteries since 1988 and is a serious competitor in the global hearing aid battery market. 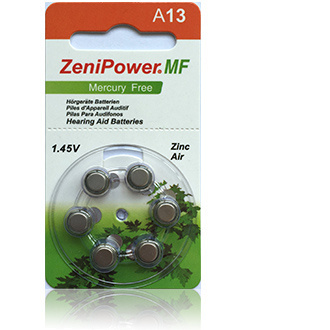 Currently Zenipower supply hearing aid batteries to the UK National Health Service (NHS). Over the years, Zenipower has developed exclusive patented battery technology and coupled this with automatic production lines and organization to achieve the coveted, ISO9001 strict management certification. The results are very high performance, high reliability, and low cost for Zenipower's entire line of hearing aid and cochlear implant batteries. With Zenipower’s High Performance batteries you can expect few battery replacements, clear tones, less distortion, fewer volume adjustments, and longer service life. 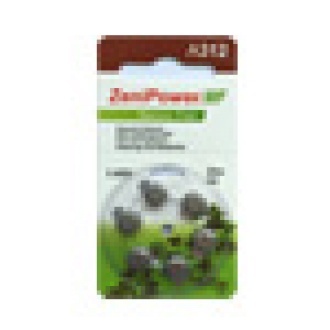 The batteries have an excellent shelf life of up to three years.